Walnut is nutritious food that complements a wide range of flavors. They contain a plant based source of omega 3 fatty acid and provide protein. Plus they are easy to find everywhere. Get into the habit of adding them to your healthy diet. Here are some reasons to use walnuts in your kitchen. A quarter cup of walnut provides 90 percent of the daily value. A single serving has more protein than for instance one egg. Walnut is full of potassium, manganese, calcium, copper, magnesium, iron, selenium and zinc. Walnut has some of the highest antioxidant content of the tree nuts. Researchers found that two ounces of a daily doze reduces the growth of breast cancer tumors in humans. Walnut is free from having any trans fats or cholesterol. Mix a banana, plain fat free yogurt, walnuts and some honey in a blender for a breakfast smoothie which will keep you feeling energized throughout your day. Add chopped walnuts to the breakfast oatmeal or whole grain cereal. Toast a half cup walnut in the oven at 355 for about ten minutes. Blend with a chopped clove of garlic, one can of drained and rinsed chickpeas, the juice of one lemon and salt and pepper for taste. It is excellent for your heart and circulatory system. Combine thawed frozen edamame, walnuts, parsley, one clove garlic and plain fat free yogurt in the food processor and mix until smooth. 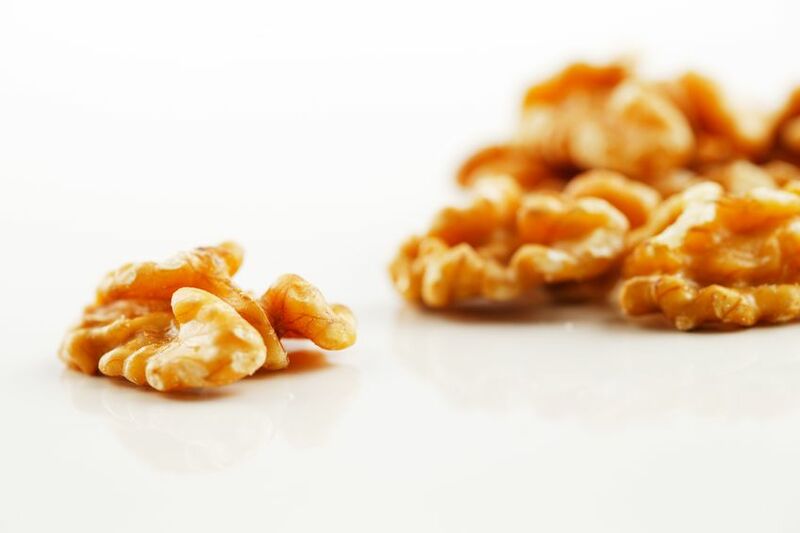 Its high α linolenic acid content helps maintain the elasticity of your arteries that aids circulation.Walnut can lower cholesterol and decrease the risk of heart disease. Combine canned tuna with an avocado, a chopped apple and diced celery. Sprinkle with fresh lime juice and light toasted walnuts for a citrusy protein punch. Walnut is high in vitamin B and E. Toss watermelon cubes, blueberries, bell pepper and walnuts with vinaigrette and serve on arugula. 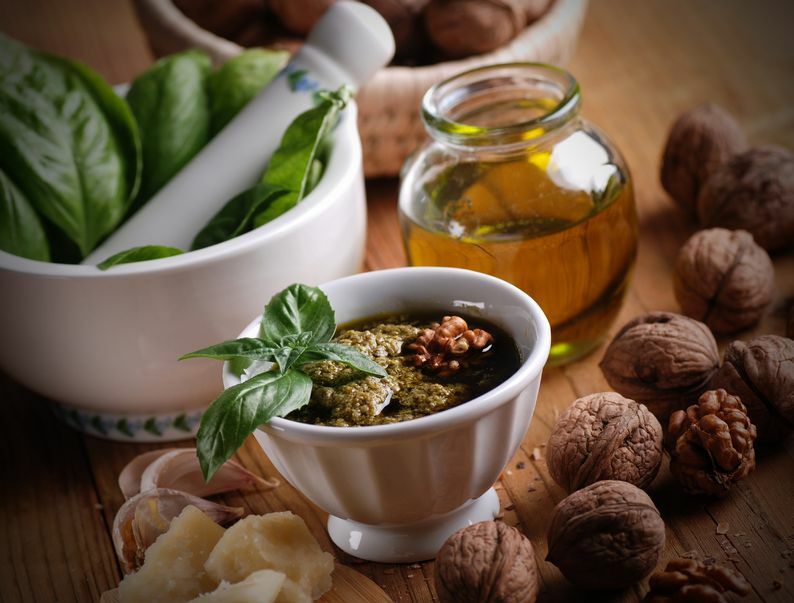 Walnut is more effective than olive oil in countering the ill effects of high-fat foods. Sprinkle olive oil on whole grain pizza dough, top with red onions, sliced bell peppers, a few olives, add a little shredded cheese, top with walnuts and bake for about 17 minutes. Toast walnuts, put them in a food processor and blend until smooth. Add honey or cinnamon if you like. Its high α linolenic acid content helps maintain the elasticity of your arteries that aids circulation. Combine whole grain pasta with crumbled goat cheese, sundried tomatoes, walnuts and arugula for a quick creamy crunchy meal. 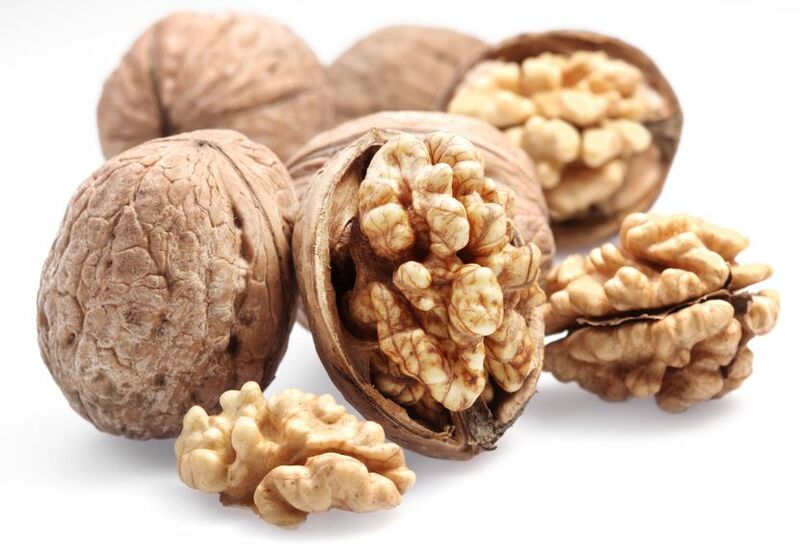 Old medicine suggests that walnuts boost functions of the kidneys, strengthen the back, act as an astringent to the lungs, relieve asthma and lubricate the intestines. Combine basil, walnuts, olive oil and garlic in a food processor. Serve with pasta, on a sandwich or mix with grains. Cut an apple into wedges and toss with lemon juice, cinnamon, vanilla and raisins. Cover and microwave. Sprinkle with walnuts and mmm!